A cast of characters representing San Francisco's legendary Survival Research Laboratoriesresponsible for "producing the most dangerous shows on Earth"appeared in full force on Friday, April 9th at the Lab Gallery in San Francisco to celebrate SRL's 25th anniversary. The gallery was packed to capacity with friends, family and admirers of the group to shower them with good tidings and to reminisce about SRL's 25 years in-the-making. Large-scale prints displaying images from every live show that SRL has presented since its inception in 1979 filled the gallery walls from top to bottom. 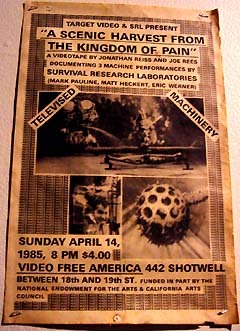 Some of the objects on display included promotional posters from past shows, various smaller machines that SRL have created, as well as a leather glove designed for Pauline after he underwent reconstructive surgery on his hand (which was tragically blown off by one of his machines in 1982.) Videos of performances were also projected and looped throughout parts of the gallery. The majority of the evening was filled with interviews and discussions between RE/Search Publications founder (and the event's coordinator) V.Vale and individual SRL members in attendancebeginning with a very engaging discussion between Vale, SF Supervisor Matt Gonzalez and SRL founder Mark Pauline. Gonzalez, who is no stranger to the arts, proved his cogency of contemporary, conceptual and applied art forms as he conducted a live interview with Pauline (while Vale moderated). 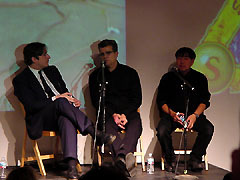 Gonzalez, skillfully negotiating an appropriate position between his role as a political figure and his appreciation for artistic expression, asked a range of questions about influences, intention, and results. These pinnacled with a comparison to the early twentieth-century Italian artist-group, the Futuristsknown for their engagement with industrial materials and their interest in war, speed and progress. To this Pauline responded: "I think the Futurists were great, but unfortunately....they were believers. They started believing in that stuff. I mean, it's a beautiful thought, but if you really start living your life as if it IS your lifeyou start pretending that's what it's really all aboutyou're gonna, you know, want to vote for Mussolini, and go to wars and other ridiculous things." Over the course of nearly an hour, Pauline explained that the intention of SRL is basically to highlight the absurdity of our contemporary condition by undermining the system using the very rules of the game set before them. SRL productions, as Pauline explained, are really just a heightening of the elements that are already presentof human emotion and our abundance of material resources. The results become highly optimized displays of spectacle that challenge the very system from which they came. As Pauline pointed out: "Part of making a show work with machines and robots that are pretty one-dimensional is that you've got to create an atmosphere. And creating an atmosphere can be very dangerous. Wars are started by people who were creating atmospheres...."
Many of the questions from the audience were strangely explicit challenges to SRL's bombastic approachquestioning how SRL machines are different from the military gear used in wars, what kind of machine of mass destruction SRL might make and what would happen if someone were killed at an SRL show. To this, Pauline calmly answered: "Well that would be very unfortunate, and probably the end of my career. We're very careful. ...we live in a society where we have devices and machines that we're allowed to operate that can kill other people. I would say that an SRL show, or at least the machines at an SRL show aren't any more dangerous than cars driving down the street." After a brief statement from California Congresswoman Lynn Woolsey about the importance of maintaining our right to freedom of speech (and a few words about how proud she is of her son-in-law, Mark) the remaining members of SRL who were in attendance that evening were called up by Vale to say a few words about their experiences with the group. He began by talking with Karen Marcelo who is one of the many women techies behind SRL responsible for creating and running the shows. Vale highlighted the fact that women have always been and continue to be an important part of SRL. It is the women who make SRL less of a "boys club" who play with big machines and more of a group of artists committed to confronting social and political issues of the day. Marcelo and the others talked about how they came to be involved with SRL, what they do to make the shows happen and some of the memories they have of their experiences. Pauline sat nearby and listened intently, clearly appreciating the experience. The evening was topped with a live demonstration of one of SRL's machinesa tall, telescopic vessel parked in front of the gallery on Capp Street which emitted extremely loud sounds from its barrel and which inevitably brought an immediate response by the SF police force. Such response from fire and police departments is a regular and expected element of every live SRL performance and the crew handled the situation with familiarity and grace. The crowd in attendance certainly got a kick out of the spectacle and cheered on the whole scene while the herds of Friday night Mission District traffic passed, totally bewildered. Kathleen Quillian and Gilbert Guerrero are co-editors of the ATA webzine and they recycle. © 2004 Artists' Television Access. All rights reserved.